Home Flow Meet Gboard: Search, GIFs, emojis & more. Right from your keyboard. Say you’re texting with a friend about tomorrow’s lunch plans. They ask you for the address. Until now it’s worked like this: You leave your texting app. Open Search. Find the restaurant. Copy the address. Switch back to your texts. Paste the address into a message. And finally, hit send. Searching and sending stuff on your phone shouldn’t be that difficult. 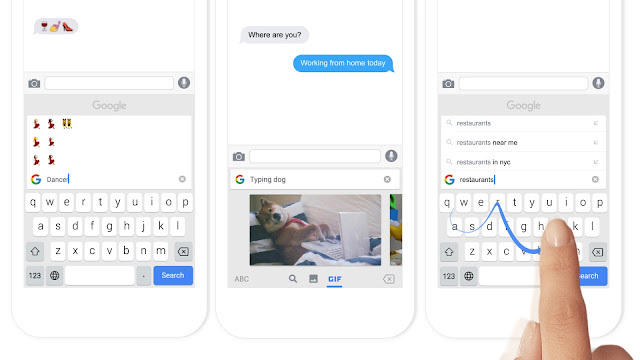 With Gboard, you can search and send all kinds of things—restaurant info, flight times, news articles—right from your keyboard. Anything you’d search on Google, you can search with Gboard. Results appear as cards with the key information front and center, such as the phone number, ratings and hours. With one tap, you can send it to your friend and you keep the conversation going. Search in Gboard You can search for more than just Google search results. Instead of scrolling to find? or ? , search for “dancer” and find that emoji you were looking for instantly. Even better—you can search for the perfect GIF to show people how you’re really feeling. Finally, Gboard has Glide Typing, which lets you type words by sliding your finger from key to key instead of tapping—so everything you do is just a little bit faster. Next articleGenetically engineered immune cells are saving the lives of cancer patients. That may be just the start.